Hyundai has developed a premium sedan, Equus, offered first on Korean market, but now nobody knows if the model will arrive in Europe. Equus premium aims direct competition (BMW, Mercedes, Audi) and even similar to the S-Klasse at the front. 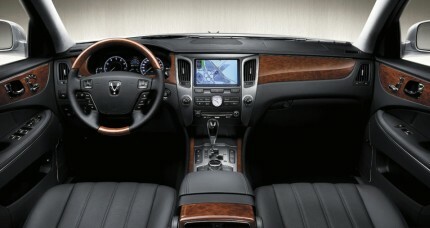 Ambitions are present luxury and interior, where wood inserts and leather are used in excess. 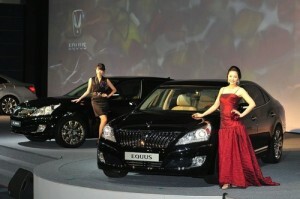 The EQUUS comes with a choice of two gasoline/petrol engines, the 3.8 liter V6 Lambda or the 4.6 liter V8 Tau. The Lambda pumps out 285 hp and 358 Nm of torque. The Tau is good for 360 hp and 439 Nm of cranking power. The EQUUS is available in 4 trim levels and prices begin at 63.7 million won (33,514 euros) for the VS380 and max out at 105 million won (55,857 euros) for the VS460 Prestige.